Where Is The Word Electric? 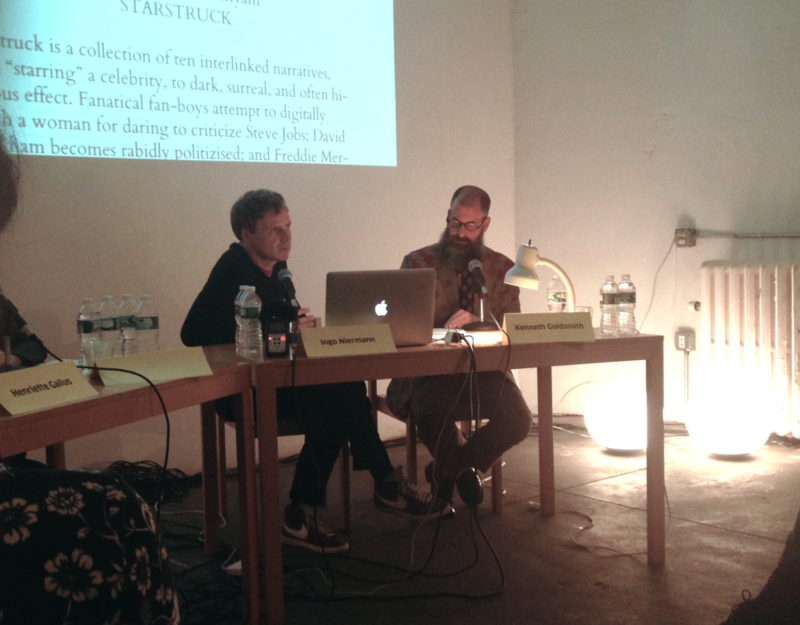 Last Saturday, the good people from Fiktion and the Goethe Institute New York hosted a five hour long examination of literature in the digital age. Besides luring in onlookers with crowdpleasers like Boris Groys and Kenneth Goldsmith, „The Word Electric“ offered talks and discussions by a range of, mostly US based, literary magazines (Genius, The Rumpus, Words without Borders), publishers (Sorry House, O/R Books, Badlands Unlimited, Fiktion), and artists (Emily Segal, Paul Chan, Goldsmith). This was all very interesting, but given the title, it was not what I expected. „The Word Electric“ was the least discussed topic, amidst all the talk of how to finance, promote, and develop a literary magazine/website/publishing house on the internet. This focus on the entrepreneurial practicalities – and in Paul Chan’s case, downright cheerful capitalism affirmation – reminded me of what Gregor told me about a similar event at the Frankfurt Bookfair last month. At least partly a theme of the Electric Book Fair was the ebook, and the hopes attached to the format as a new way of distributing literature and an economic model, without actually talking about the literature distributed [see however Fabian’s comment below]. The Word Electric was absent there as it was here. The Word Electric. Ingo Niermann (Fiktion) and Kenneth Goldsmith (UbuWeb). Goldsmith only attended as moderator and later in his function as UbuWeb founder. It seemed that all the publishers, writers, and magazine people on the various panels fell prey to the belief that a new container for literature already changes the literature contained. One could call this the hylemorphic fallacy, the idea that the newness of a form renders unnecessary thinking about what to put in it. And while it is true that new media create new content and behavior – one reads literature differently on an electronic device, and for almost 35 years, texts have been written differently with word processors – all these changes are in praxi still superficial and bound to a replication of the physical book. The question whether one could publish the ebooks offered at the different publishers’ website also as normal books was answered in the affirmative. This was the systematic confusion of Boris Groys, who gave the keynote last Saturday. The inability to see the two sides of the Internet – as technological potential and social reality – made his talk so disappointing. He repeated old hat institutional critique and – „the Internet is not selective“ – praised the Web as level playing field (technological potential) while overlooking the reintroduction of gatekeepers and exclusionary mechanisms through means of social capital and corporate power (social reality). It did not help that he oozed highly quotable but due to their quotability in the end meaningless phrases like: „The Internet is a church that substitutes god with the algorithm.“ – There are many things one could say about Groys’s razor-thin grasp of the Internet’s both technical and social side, but it must suffice to mention that he conceives of the „re-entry of the author“ as the fact of his or her buying things online, or the fact that one’s first contact with literature online is by googling an author’s name, or to claim the Internet to be a place of truth (mixing up truth and truthfulness, and again confusing the technical side, absolute surveillance, and the social side, the ability to take on fluid identities). I lost my notes on the rest of his talk but I assure you it did not get any better.